Racial tension between Native American and white people on and near Indian reservations is an ongoing problem in the United States. As far back as 1886, the Supreme Court said that "because of local ill feeling, the people of the United States where [Indian tribes] are found are often their deadliest enemies." This book examines the history of troubled relations on and around Rosebud Reservation in South Dakota over the last three decades and asks why Lakota Indians and whites living there became hostile to one another. Thomas Biolsi's important study traces the origins of racial tension between Native Americans and whites to federal laws themselves, showing how the courts have created opposing political interests along race lines. 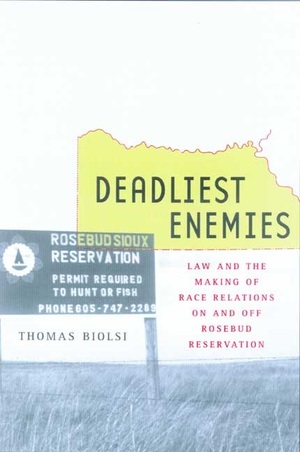 Drawing on local archival research and ethnographic fieldwork on Rosebud Reservation, Biolsi argues that the court's definitions of legal rights—both constitutional and treaty rights—make solutions to Indian-white problems difficult. Although much of his argument rests on his analysis of legal cases, the central theoretical concern of the book is the discourse rooted in legal texts and how it applies to everyday social practices. This nuanced and powerful study sheds much-needed light on why there are such difficulties between Native Americans and whites in South Dakota and in the rest of the United States. Thomas Biolsi is Professor of Anthropology at Portland State University, author of Organizing the Lakota: The Political Economy of the New Deal on Pine Ridge and Rosebud Reservations (1992), and coeditor of Indians and Anthropologists: Vine Deloria, Jr., and the Critique of Anthropology (1997).